This site has been designed to supplement the instruction of Intermediate Uzbek at the University of Washington. In addition to serving the needs of UW students, it has been constructed to be fully-accessible on the Internet so as to make it available as a resource for students of Uzbek everywhere. If you don't have QuickTime 6 installed on your computer, go to Apple's Quicktime page to download it for free. For other problems, please see the troubleshooting page. To navigate this site, use the belts and arrows that appear at the bottom of each page and the menu in the frame on the left. The side navigation frame on the left allows you to explore sites related to the study of Uzbek on the Internet and helps you find your way back home. The belts and arrows let you move through the internal pages. 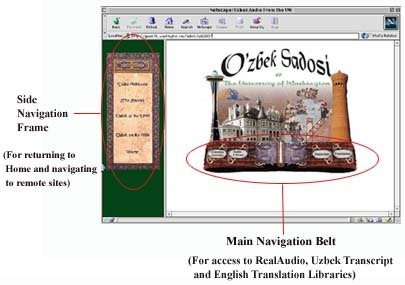 The main navigation belt on the home page lets you access libraries of the RealAudio versions of the stories, Uzbek transcripts and English translations. 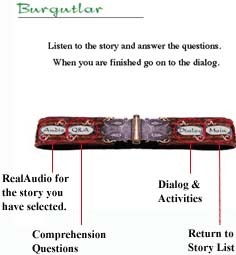 From here you can also access the Listening Activities which are based around each story. Here , you will presented a small series of questions to check your understanding of the story after you have listened to it. The response to your answer, will not be a simple "yes" or "no", so you will have to read each response carefully to see how well you understood what you have heard. The idea is not to get a "right" or "wrong" on the answers, but to enrich your comprehension of the story. This allows you to listen to the dialogs one line at a time. Thus, there is no time constraint on your response. You can read your lines from the text at your leisure. This runs audio of the voice of one of the characters in the dialog at a natural cadence and you must respond before the speaker begins the next line. You still have the text on the screen to assist you. Remember that when the character you have chosen has the first line, there will be a pause at the beginning to give you time to deliver the line. After you have practiced the dialog several times, see if you can handle this step where the text is removed and you must maintain the pace of the dialog. Help is available throughout the site to help you overcome common problems. 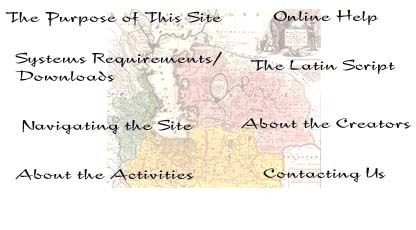 Wherever you see the medallion with the question mark, there is detailed information about how to properly use that part of the site. After more than 60 years of being written in a Cyrillic script, Uzbek is in the process of adopting a new Latin script. This is, in fact not the first time that Uzbek has been written with a Latin-based alphabet. In the late 1920's, Uzbek switched from Arabic script to Latin for a brief period before moving to Cyrillic in the 30's. One of the key reasons for the recent changes of alphabets is to better facilitate the use of Uzbek in media like the Internet. Therefore, we felt it appropriate (and considerably easier for developer and user alike) to use the Latin script on this site. for her support of this project and her dedication to the field of Central Asian Studies.